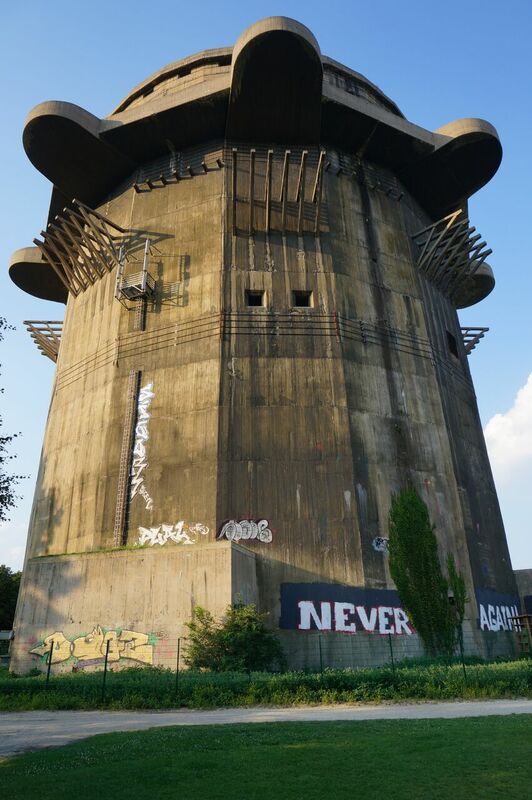 This combat tower is part of one of three flak tower complexes that were built in Vienna by Nazi Germany as defence against Allied air raids. Flak towers were also built in Berlin and Hamburg, and could serve as air-raid shelters which could protect tens of thousands of civilians. In 1942 Adolf Hitler decided to build six flak towers to protect the historic city centre of the so-called Gauhauptstadt Vienna from destruction from Allied air strikes. The existing towers in Berlin and Hamburg served as models for the architect Friedrich Tamms. All the flak towers are grouped in twos, with a Gefechtsturm (combat tower) and a Leitturm (lead tower) forming one pair. These pairs of towers are arranged in a triangle around the heart of Vienna’s historic centre, the Stephansdom. 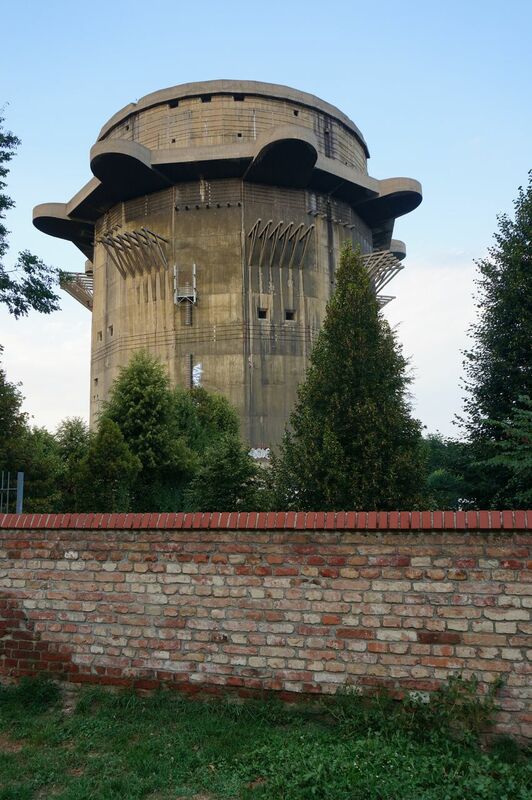 Originally, the Nazis planned to convert the flak towers into gigantic victory monuments to fallen German soldiers. After the war, the towers were to have been clad in white marble. Fortunately, history turned out differently. The two flak towers in the baroque Augarten gardens were completed just a year before the end of the Second World War. However, with the Allied bombers flying at such high altitudes the towers were rendered almost useless for military reasons. After the defeat of the German Reich in May 1945 the flak towers stood empty for many years. Unlike in Berlin and Hamburg, the Allies did not attempt to destroy these giant grey blocks. One reason might have been Austria’s long-standing claim as a victim of Nazi aggression. As a result, the towers remain as concrete witnesses to the crimes committed by the Nazi dictatorship and as unforgettable reminders and warnings of Austria’s culpability. But, until now, there has never been an active historical reappraisal. After more than 70 years, the concrete towers are now an essential and integral part of the city of Vienna and its inhabitants. Today, the overall appearance of the Augarten park is defined by the tension between its tranquil idyll and acts of violence and destruction. A huge graffiti in the plinth area with the words ‘Never Again’ now greets visitors to the park. Both towers in the Augarten park are owned by the Republic of Austria and administered by the Burghauptmannschaft. Although they have been leased by a data company (since 2002), to be renovated and used as huge data centres, they remain empty and closed to this day. A previous plan proposed the Gefechtsturm to be repurposed as a museum for contemporary history (between 1986 and 1999). The Augarten Gefechtsturm is a hexadecagon 43 meters in diameter. 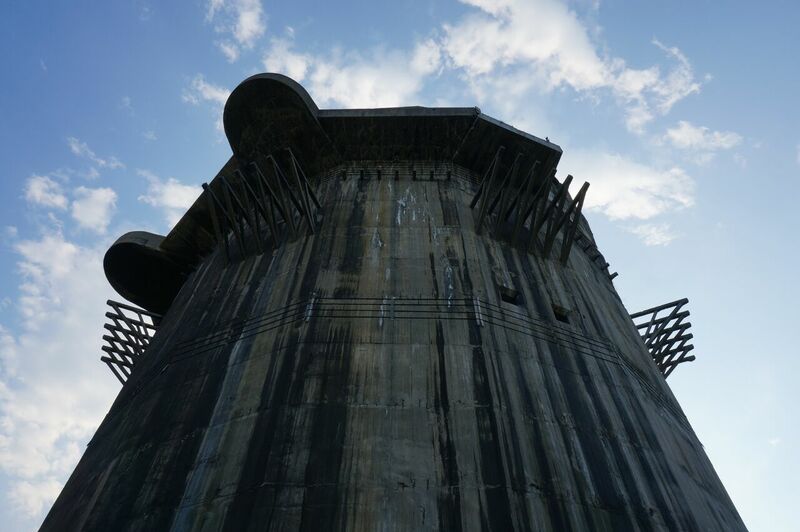 It is 55 meters high, has a basement and 13 storeys plus an added level for cannons. Most of the outer walls are 2.5 meters thick and the uppermost ceiling is between 3.5 meters and 4 meters thick. 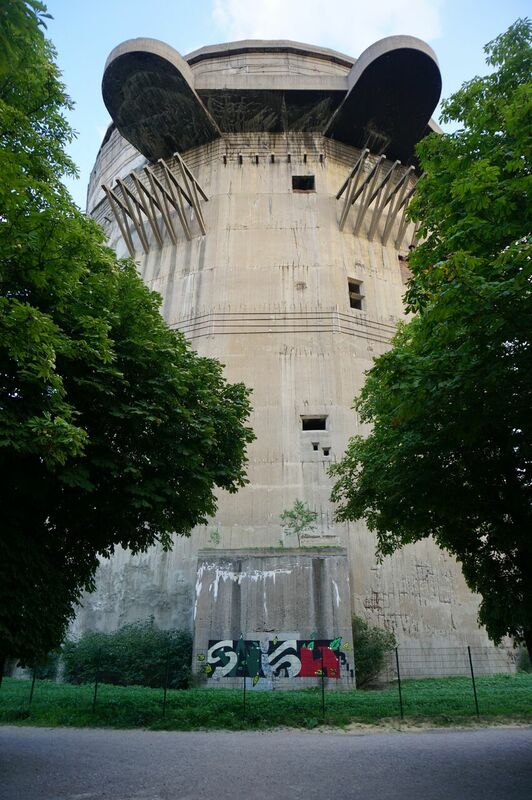 The flak tower consists of more than 45,000 cubic metres of reinforced concrete. 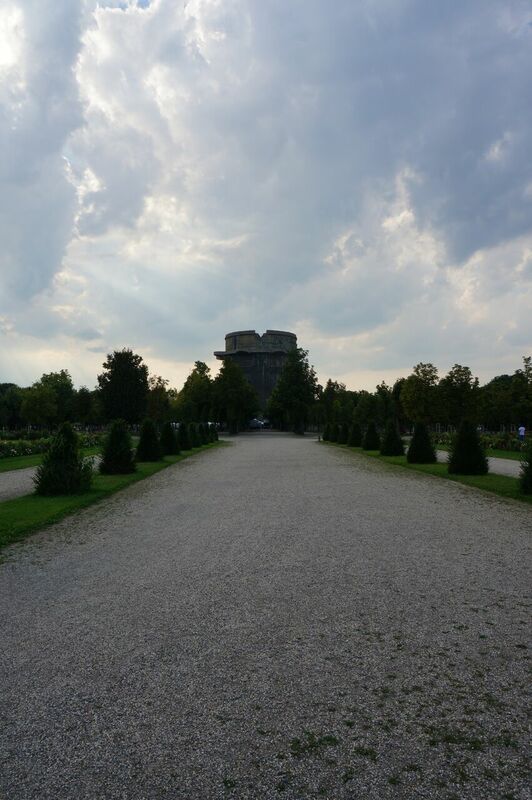 Like every flak tower, this one also has an integrated natural climate system, which has remained almost intact. The entire technical infrastructure (electricity, water, gas, lift) has either been demolished or not been preserved. Following a grenade explosion caused by children playing in 1946 the Gefechtsturm is badly damaged both on the inside and the outside, particularly the upper storeys. As part of restructuring measures in 2007 two of the platforms known as Schwalbennester (swallow’s nests), which originally served as gun emplacements, were removed as they were at risk of collapsing. As far as I know it’s some sort of anti-aircraft tower. Just like the one for example at the Haus des Meeres, in the centre of the city. I think the building was supposed to provide some sort of defence measures. So yes, that’s what I think. And I think the way they’ve used it, at the Haus des Meeres for example, is very interesting. Because it’s been linked with a sort of commemorative project. I think they could do something very nice here too, like some sort of memorial site, of remembrance relating to the Second World War for example. You’re right, perhaps there is some sort of plaque somewhere. With a time of year and the reason and why it’s still standing there. They were also planning to use it for some purpose or other, inside. Like they have for that – what’s it called again, where the animals are – the Haus des Meeres, but there were problems, because of access. That is wasn’t possible. Companies were interested in it, but they would have needed access and keep it open the whole time. I find it irritating that there’s no information here. No information panel about what it was. But whenever I walk past, it reminds me of a sad chapter. – The first idea that springs to mind is to landscape it. So at least the bunker disappears behind some greenery, give it an eco-purpose. After the war, I can’t remember exactly what year it was, but they tried to blow up the towers. But that concrete is so thick it’s impossible. They would have to use so much force that the buildings all around would be affected. That’s why it’s still standing there, like a monument. That was used to protect people, from the air raids. They had anti-aircraft guns on top, flak towers is what they called them, an air defence system. And whenever there was a bomb alarm people would run inside, for protection. That’s what it was built for!